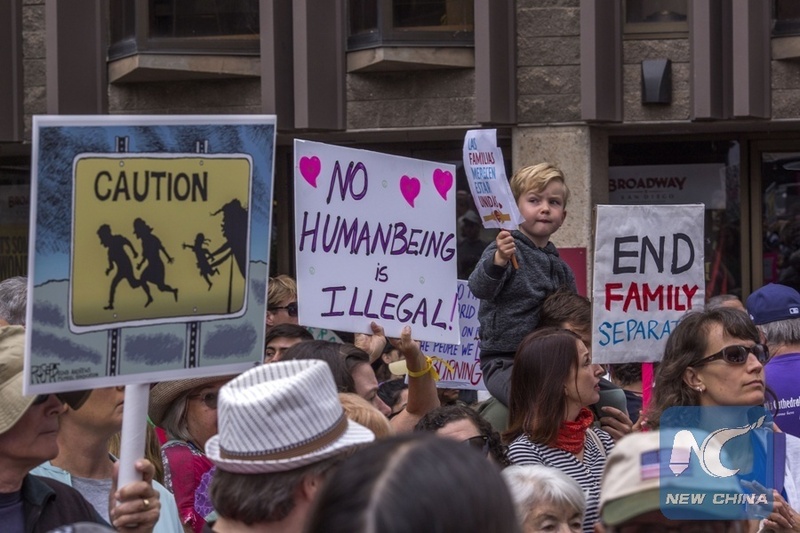 LOS ANGELES, June 26 (Xinhua) -- A federal judge in San Diego, California issued a preliminary injunction on Tuesday ordering the U.S. border authority to stop separating migrant parents and children who have crossed over from Mexico and to work to reunite the separated families within 30 days. Dana Makoto Sabraw, a judge of the U.S. District Court for the Southern District of California, issued the nationwide injunction in a lawsuit filed by an anonymous woman from the Democratic Republic of Congo and backed by the American Civil Liberties Union (ACLU). The order said immigration agents must "stop separating parents and children without an objective finding that a parent is unfit," "reunify families with children under age 5 within 14 days," "reunify families with children 5 years old and older within 30 days" and "let parents speak with their children by telephone within 10 days." The Trump administration's policy of separating children from immigrant parents caught crossing the border illegally triggered enormous public outrage across the country. Under political pressure, U.S. President Donald Trump issued an executive order to end the policy last Wednesday but the government has yet to reunite about 2,000 children with their parents. Sabraw also wrote in the injunction that Trump's newest order "is silent on the issue of reuniting families that have already been separated or will be separated in the future." Lee Gelernt, deputy director of the ACLU's Immigrants' Rights Project, who argued the case, was quoted by NBC news as saying that Sabraw's ruling is "an enormous victory for parents and children who thought they may never see each other again." "Tears will be flowing in detention centers across the country when the families learn they will be reunited," he said.